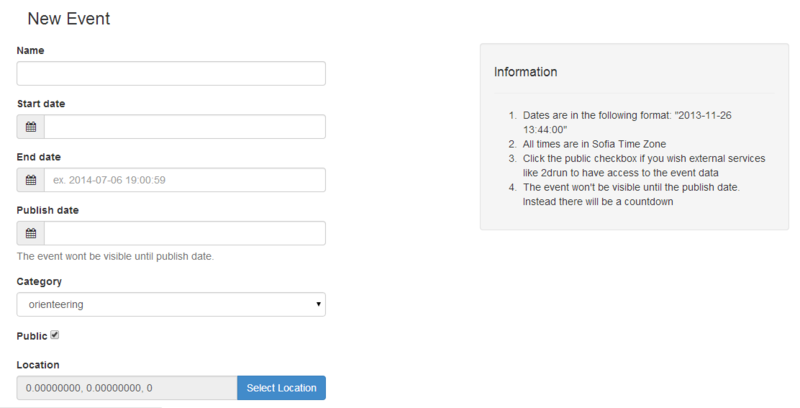 From the menu on the left we click "Events"
You will see a list of all your previous and future events ordered by date. We select New Event which opens up the menu for creating a event. Start Date is the date/time which the event will start. End Date is the end of the event. If you are not sure when the event will end choose a later time just in case. Later you can come back end edit the valid end date. Publish date - date/time when the event will be visible to the public. Before this date/time a countdown page will be displayed and the event map and competitors won't be visible. 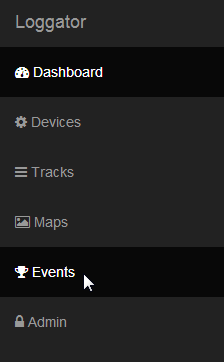 The "Public" checkbox determines whether the event will be visible on Loggator.com in the Recent Events page or not. You can still share the link of the event with friends. "Location" Is the events location. We use it to center the map on the right place when the event is shown. When you click on the button a popup will show. We select the location on the map, click save, and then close the location popup.